The Taj Mahal is a mausoleum, ie a large funerary monument. Here, one can even say very large dimensions, especially since it was built to accommodate the tomb of one person, the wife of the Mughal emperor Shah Jahan, in the 17th century. It is a rectangular site 500m long by 300 by a high wall and divided into 3 parts: In the south, an inner courtyard, a kind of lock between the outer life and the inner peace, the gardens, symbols of Paradise according to the Muslims, and the mausoleum itself, surrounded by two symmetrical buildings, including a mosque. The whole site is relatively large and is therefore not limited to the white marble mausoleum that we know: There is also, apart from the mosque, a large portal, the mausoleums of the first two women of Shah Jahan, service buildings, guard towers along the wall, arcades that once housed the merchant population, and so on. Learn more about the Taj Mahal. The Taj Mahal is located in India, in Agra, a large city located 175Kms east of the capital, New Delhi. It takes between 3h and 3h30 to reach both cities, according to local road standards. In Agra the monument is only a few kilometers from the city center to the east, in the area that served as residential areas to the Mughal princes in the seventeenth century. The Taj Mahal is on the edge of the Yamunâ, the local river, from which it is separated by a wall of red sandstone inlaid with white marble. 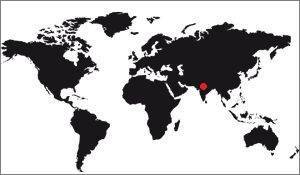 Learn more about the Location of the Taj Mahal. What are the dimensions of the Taj Mahal? The Taj Mahal is above all a large rectangular site. It is more than 500m long by 300 wide, but this is the whole site, with its inner courtyard and gardens (which alone make 300m by 300m). The mausoleum, on the other hand, measures 58,60m for a total height of 73m. It is an octogen surmounted by a large dome in the form of a bulb. It is placed on a marble base of 95,16m. If the site is large enough, the mausoleum is equally impressive, with its almost 60m wide. Learn more about the Dimensions of the Taj Mahal. In what material is the Taj Mahal fabricated? It is white marble, but contrary to what one might think, it is not massive marble. In fact, the mausoleum and the southern door, in the inner courtyard, are made of brick, and therefore of a very classic construction. On the other hand the bricks have been covered with large plates of marble, which gives this white color. The marble has been inlaid with a large number of semi-precise or precise stones, as well as bursts of black marble. The gateway to the gardens, the Darwaza-i rauza, is made of red bricks inlaid with marble. The Taj Mahal is a mausoleum and was built as a tomb for the third wife of the 5th Mughal Emperor, a dynasty that ruled from the 16th to the 19th century in northern India. The 5th Emperor was Shah Jahan, one of the most powerful of this dynasty. 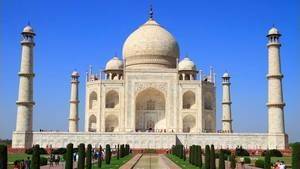 He formed a fusional couple with his third wife, Mumtaz Mahal, also at his death (in bed, giving birth to his 14th child), the Emperor had built the most beautiful mausoleum that can exist. This is the Taj Mahal. Learn more about Shah Jahan. Is it true that there should have been a 2nd Taj Mahal, black that one? No, not at all, it's a legend. There are two versions of this legend, the most often put forward being that Shah Jahan had the Taj Mahal built for his wife, himself reserving an identical but black tomb on the other side of the river. river Yamunâ. In fact it is simply false, on the one hand it seems that it was not a project of the emperor, then if it had been, the finances of the Empire would not have allowed it since the Taj Mahal had already been a chasm for the crates. This legend is all the more tenacious as relatively recent archaeological excavations have revealed the existence of an early construction on the ground, just opposite the Taj Mahal, the "Mehtab Bagh." But this is a a garden which is owed to the first emperor Bâbur, and which is considered the first Mughal-style garden in the history of this empire. Learn more about the black Taj Mahal. Why is everything so symmetrical, on the spot? It is quite simple, because symmetry is synonymous with harmony, which was sought by the initiator of the project. In this sense the Mughal civilization is very similar to Chinese civilization, there are great similarities between the Taj Mahal and the forbidden city of Beijing, even if it does not immediately strike the eye. Learn more about the description of the Taj Mahal. Why do the gardens symbolize Paradise? Simply because the gardens are representations of Paradise, seen by Islam. This is due to the fact that this religion was born in Saudi Arabia and spread over desert lands. Water, vegetation, all this evoked well-being, rest. By extension, when it was necessary to represent Paradise, it was a garden that was used. Learn more about the gardens of the Taj Mahal. Who had the idea to build the Taj Mahal? The Taj Mahal is a building ordered by Shah Jahan, the 5th Mughal emperor, a dynasty that ruled northern India from the 16th to the 19th century. Son of Jahângîr and a Persian princess, Manmati, he received a refined education and early showed an interest in the art of war and architecture. He expanded the territories of the Empire on behalf of his father, then, at his death, led an expansionist policy while consolidating the peoples of the interior of his Empire. Shah Jahan is behind the construction of New Delhi, its mosque and many other buildings. His court was impressive, he himself had a great treasure. How long was its construction? It has not been that long, but the time scale is still on a man's life. The Taj Mahal was begun in 1631 and was completed in 1648, 17 years old, to make the mausoleum. The rest of the gardens, the enclosure and the inner courtyard were only completed in 1953, 5 years later. Learn more about the history of the Taj Mahal. What changes have been made to it in history? And very little, so to speak. The Taj Mahal is probably one of the monuments to the World that is best preserved in relation to its original state. Neither the mosque, nor the visitors' pavilion, nor even the mausoleum were really altered during its history, they were just maintained. On the other hand, the gardens were partially redone during the British colonization. While it was originally a garden, the English turned it into a French garden, with large lawns well maintained.